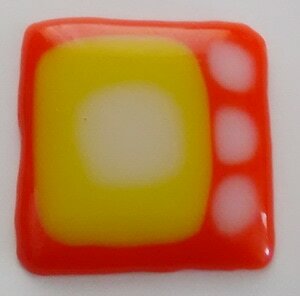 This small pendant (left) was made using layers of orange, yellow and white glass (COE 90). It was my first go at fusing. It was fused in a microwave kiln. Yes, in a standard kitchen microwave. The inside wall of the kiln has a special surface that does not let the heat escape and allows glass to melt to a red hot molten level. Pictured right is the kiln just removed from the microwave. Finished fused glass held upside down. Whole piece was 7 cm wide. Below are photos step by step how I experimented and used two stacks of kiln paper (1cm wide)to create a slumped pattern in the glass while it was being fired. I used stacked strips but you could cut shapes of hearts or leaves etc. 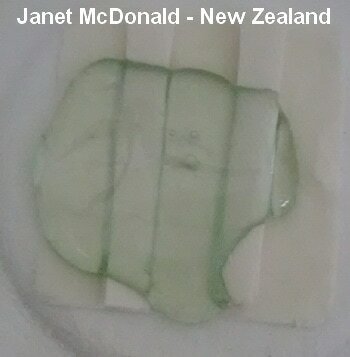 Place your kiln paper design shape in the center of your MWK and place glass layers over your design shape with about a 1cm overhang of glass. 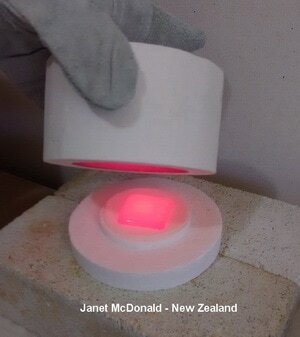 For thin kiln paper you will need 5 layers of the Kiln paper. 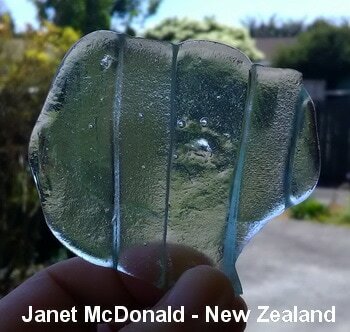 Showing after fusing when glass has slumped around the shapes of the kiln paper strips. 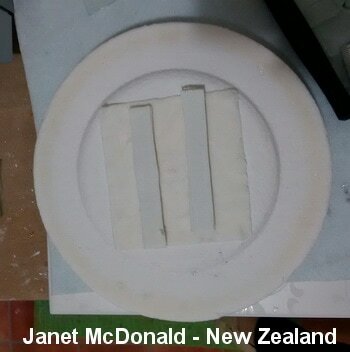 Random shapes and sizes of float glass were stack in 3 layers on the top of the kiln paper. Finished slumped glass shown from the front. The front is smooth without being able to feel the channels. 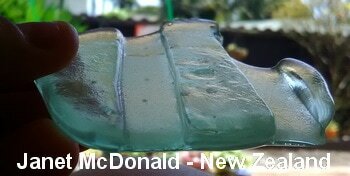 I was not worried about which was the tin side of the float glass as this was all and experiment for me. Finished slumped glass shown from the back. The back shows the channels.